If you are worried about “cottage cheese” ceilings in your residential home, I highly recommend you to purchase a test kit and or hire an asbestos abatement professional. If you purchase a test kit, you will have to gather a sample of the ceiling and mail it to a lab for further investigation. Furthermore, a licensed professional may be costly, but your health is what’s most important. Also, many professionals recommend you to not only test for asbestos, but also test your ceilings for lead paint. You may ask yourself, what do I do now that I know that my popcorn ceiling contains asbestos? Can I remove it myself? The answer is simple, no! Leave it to the professionals only. Even the littlest percentage of asbestos is detrimental to your health. If your ceiling has any asbestos make sure to extract and removed immediately before your health is greatly affected. When removing asbestos, the materials involved release toxic fumes of unwanted ashes and flakes throughout the air. By breathing in asbestos dust will lead to serious diseases such as lung cancer, asbestosis and mesothelioma. Removing asbestos is very troublesome and a big mess to clean up. Any amount of asbestos on your popcorn ceiling is highly dangerous. Don’t think just because you have a little bit of asbestos in your ceiling that you have to take action to remove it. Any amount will affect your health in the long run. If you don’t completely remove your asbestos popcorn ceiling you should encapsulate it. By encapsulating your popcorn ceiling the asbestos will remain untroubled and so will your health. But, the safest way to go is to have a professional remove your asbestos popcorn ceiling because that way you know it will be done correctly. Old homes have been known to have popcorn ceilings, so it’s best to get it tested for asbestos before your health changes for the worse. Generally, having a high amount of asbestos will be much worse, but even the slightest bit of asbestos needs to be taken care of immediately. In 1978, there was a law called, “The Clean Air Act.” This law had banned spray-on asbestos material. Not also was it an extreme health hazard for the homeowner, but also for the workers that were administering the product. Unfortunately, this law wasn’t too harsh. This act allowed businesses to use all their current inventory, so frankly asbestos popcorn ceilings were still being applied up into the 1980s. If you or a loved one was diagnosed with any form of mesothelioma or was showing signs of Stage 4 mesothelioma symptoms before they passed, we advise that you get in touch with a mesothelioma lawyer or mesothelioma doctor as soon as possible. DO NOT disturb the ceiling with materials like tape, screws and nails. Tape the windows and doors with plastic. Discard all furniture from the room, and mask everything else that is left in the room with plastic. Turn off the home’s heating, air conditioning and ventilation to abstain growing and spreading the contamination of asbestos beyond the room. Be in protective gear. If not keep all pets and yourself away from the area. Wear throwaway overalls and cover your hair and skin to keep ceiling debris off of you completely. Keep the popcorn ceiling material damp. This will help prevent dust from getting into the air. Also, place asbestos-containing decay in a sealed and labeled plastic bag. Search for a a landfill or a trash-pickup service that can obtain the asbestos, but make sure to call them in advance prior to removing the asbestos. It is always best to have asbestos abatement done correctly from the beginning. In fact, cleaning up contamination after becomes much more costly. In most places, the law requires qualified asbestos abatement professionals to perform asbestos removal in commercial buildings and multi family homes. Single-family homes typically are allowed to carry out their own asbestos removal. Every state and city has its own regulations, but when it gets down to it, it is best to just have a professional take care of the messy situation. Encapsulation directly means to cover asbestos material so that asbestos dust will not be floating throughout the air. What do I encapsulate my asbestos popcorn ceilings with? Well, you can cover your popcorn ceiling with vinyl paint and or new ceiling panels which are extremely popular and very pleasing to look at now. Another way to cover this toxic substance to is use gypsum board ceiling panels. Gypsum Board Ceiling Panel: Gypsum board is a material that is similar to drywall, but much lighter. You can screw it into the frame of your ceiling. But really, don’t try doing this as a fixer upper project. Hire a professional because they know how to properly tape and mud the new ceiling perfectly without any imperfections left behind. Another method for encapsulating popcorn ceiling is to use a special vinyl paint. Vinyl paint isn’t just normal house paint that you use to paint your bedroom walls with. But, in fact if you decide to put normal paint on your ceiling it will actually cause the exposure that you are trying to avoid. 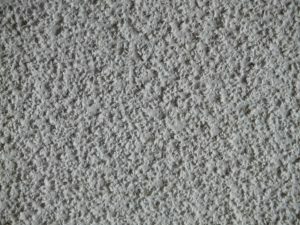 Using spray-on vinyl paint can work, but try to remember that the old popcorn ceiling texture will still be noticeable. Try to keep in mind that encapsulating is the second best solution besides removing asbestos popcorn ceiling completely. But, if you decide to do renovation work in the near future, the asbestos will become a dangerous factor again. Future homeowners will need to know and be well informed that you had found asbestos in your home that you had previously encapsulated. If you decide to blow this all off and not take precautions whether or not you have asbestos popcorn ceiling. Ignoring it can be costly. Not to mention insurance policies often DO NOT cover asbestos contamination caused by irresponsible renovations. By not following these guidelines this could leave homeowners with a huge bill for asbestos abatement. By not doing anything about it will lead you to vast amount of bills and health risks that includes lung cancer and mesothelioma. If you or a loved one is showing signs of Stage 4 mesothelioma symptoms, Stage 3 Mesothelioma Symptoms, Stage 2 Mesothelioma Symptoms or even Stage 1 Mesothelioma symptoms it is highly suggested that you contact an experienced physician. The post Asbestos Popcorn Ceilings: Are they Safe? appeared first on The Asbestos Cancer Organization. PreviousPrevious post:Can Hair Transplant Surgery Leave Scars?NextNext post:Should I Be Preventing Sun After A Hair Transplant?